Following Captain Barclays epic achievement in 1809, the London Marathon organisers have decided to incorporate a mightily similar event in this Aprils race. Calculators ready? Then well begin. 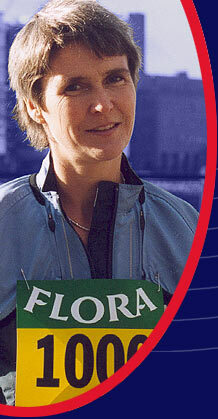 This is the tale of a new challenge from the organisers of the Flora London Marathon. Its very simple. This year six runners are being invited to take part in the Flora 1000 mile Challenge which means competitors have to run 1000 miles in 1000 hours around the London Marathon course. Thats one mile  and nor more or less than one mile  run, walked or crawled every hour for 1000 hours, or 38 ½ times around the course. You cannot miss an hour, you cannot go home for a up of tea and a good nights sleep, in fact you cannot do anything but nip in and out of the event bus on a mind blowingly frequent basis. How frequent? Well, as the number punchers who have their calculators out will tell you, youll be hopping off that bus once an hour for 41 days or more descriptively eight hours shy of six weeks! Oh, and just to make it a tad tougher, the 999th to 1000th mile will take the competitors to the start line of the London Marathon where theyll arrive just in time to start this years race! Convenient or what? And whats even more amazing is its been done before  at least the 1000 miles in 1000 hours bit has been. In 1809 to be precise by Captain Barclay who did it for a 1000 guinea bet. Peter Radford has written a book about Barclays days and it is this book that set race director Dave Bedfords brain whirring one lunchtime. "What, " he mused after a drink or two, or three "about recreating Barclays challenge up and down the course?" And so this incredible challenge was reborn. Clearly such a challenge is somewhat barmy and possibly offputting, so the organisers will be encouraging the madness by offering £6 a mile for every mile completed. A further £1000 will be awarded to everyone finishing all 1000 miles and then a further £3000 is on offer for the first one of the remaining runners to complete the Flora London Marathon. Not a bad pay day at all, although back in 1809 Captain Barclay eventually pocketed 16,000 guineas, which is around £40 million in todays cash! The competitors have been selected at a number of trials up and down the country and include Sharon Gayter and international class ultra distance runner and Britains No 1 for the last six years. Shes warmed up for the event, as have the other five (announced at the end of December), by completing 24 miles in 24 hours. "Remarkably easy, " she says, adding she is under no illusions as to how much more difficult completing six weeks of that will be. Think about it yourself. What did you do six weeks ago? What have you done in the interim? Even if youve done nothing but sit down and watch telly, thats a mightily huge chunk of time isnt it? Needless to say fatigue, lack of sleep, general ailments, anxiety and numerous other problems will occur in those six weeks and the organisers are only too aware of that. "We do know Captain Barclay lost 32lb and at points had to be beaten with sticks to get him out of his bed and back on the road, " says Radford. "But we wont be using sticks this time around, " adds medical advisor Mark Porter the resident medical expert on Radio 2s Jimmy Young programme. He does, however, admit that it has been difficult to ascertain precisely what the problems will be as clearly nothing like this has occurred for quite a while now. Blisters and muscle pulls will come into it, but mental fatigue will be the main problem, or so he reckons. And living on a bus for six weeks with five other people and possibly many many more, thanks to the media, watching wont be easy either, he adds, "Itll be like Big Brother, only in a smaller place. You just wont know how people will deal with it." What is pretty certain is the technique the competitors will be using. According to Bedford theyll all be using the Barclay method whereby youll run your mile at the end of one hour and the very start of the next, allowing yourself a full 90 minutes or so to kick back and take it easy. But should any start to tail off, every encouragement will be provided (sticks excepted) to help the competitors on their way. What no-one knows the answer to is, wholl be best equipped to win. Clearly readers of Running fitness will be visualising running such an event, but as Bedford suggests, possibly it could be someone like a super-fit sheep farmer whos used to just a few hours sleep a night in the summer? Maybe an SAS chappie, or as Gayter reckons, maybe itll be a woman whos used to getting up and looking after a newborn baby? to Glasgow, to Birmingham. Today we obviously drive." So many questions; so many hours; so many miles; one thing is for sure. Itll be a fascinating challenge that starts on March 2nd and ends sometime on April 13th on the Mall, assuming beating with sticks is allowed back into the sport.